Step on up, Hewlett-Packard (NYSE: HPQ). Since 1980, shares returned an average of 10.4% a year, compared with 11.1% a year for the S&P (both include dividends). That difference adds up fast. One thousand dollars invested in the S&P in 1980 would be worth $29,400 today. In Hewlett-Packard, it'd be worth just $23,500. Dividends accounted for a lot of those gains. 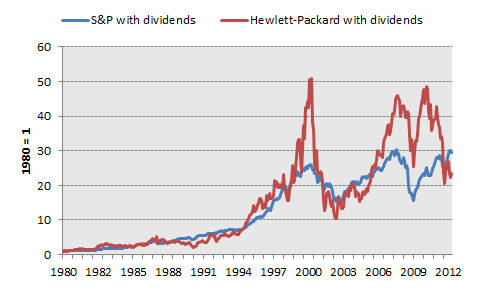 Compounded since 1980, dividends have made up 44.3% of Hewlett-Packard's total returns. For the S&P, dividends account for 41.5% of total returns. Slight outperformance, in fact. 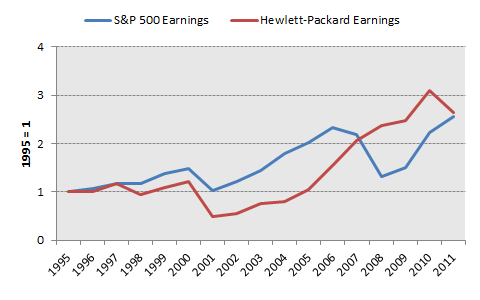 Since 1995, Hewlett-Packard's earnings per share have grown by an average of 6.3% a year, compared with 6% a year for the broader index. Despite questionable acquisitions and management fumbles, Hewlett-Packard has been able to keep its earnings power intact. That earnings-growth dynamic has led to superior valuations, historically. Hewlett-Packard has traded for an average of 23.2 times earnings since 1980, compared with 21.3 times for the S&P (though it's far different today -- HP is now one of the cheapest large-cap companies in the world). Through it all, shares have been disappointing laggards, historically. The question is whether that will continue. That's where you come in. Our CAPS community currently ranks Hewlett-Packard with a three-star rating (out of five). Do you disagree? Leave your thoughts in the comments section below, or add Hewlett-Packard to My Watchlist.